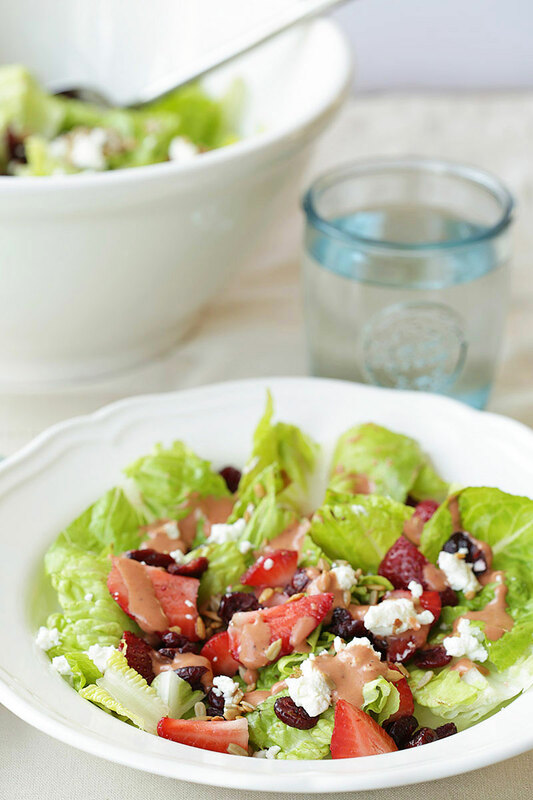 I love strawberry salad–especially strawberry salad recipes that mix lettuce with fruit — and this one with romaine lettuce is among my favorites. The combination of dried cranberries and fresh strawberries is sweet as summer. The tangy goat cheese and the Dijon mustard give it more heft, while the toasted sunflower seeds add a little surprise. You could put this over mixed greens, but I prefer using romaine because it’s so crunchy. If you’re looking to add some nuts, sliced cashews or almonds would work well. 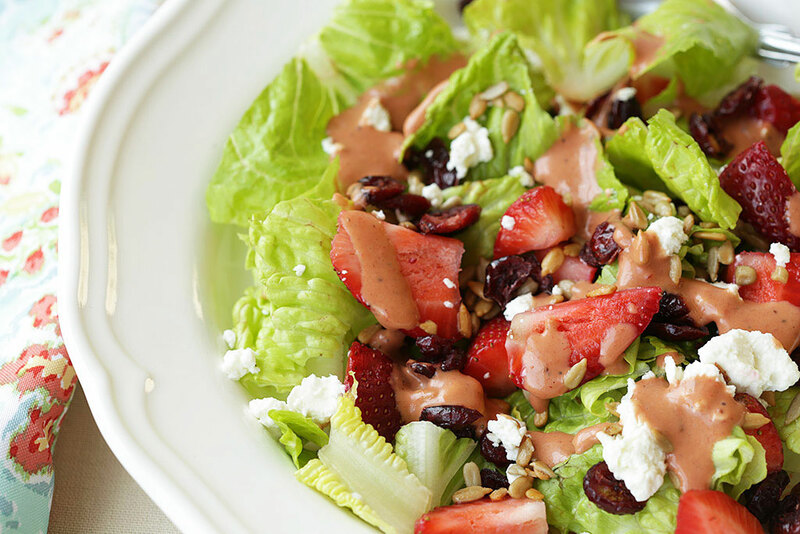 But the secret weapon is the strawberry balsamic dressing, which takes only a few minutes to whip up in a blender. A little of it goes a long way because it’s so thick. When I serve it, I drizzle just a bit on top of the main bowl, then let people add more dressing on their own plates. Once the salad is dressed, it will be good for a day. After that it can get a little soggy. So if you want to keep it really crunchy, definitely don’t dress it until the last minute. Toss the lettuce, strawberries, cranberries, and goat cheese in a large bowl. Make the dressing by pulsing all of the ingredients in a blender until it’s a smooth, thick liquid.